Aglass-fibre based material, reinforced with stainless steel wire and proofed with synthetic rubber. It has a grey surface. High temperature dry heat duties where operating pressure is low: exhausts of gas turbine and large diesel engines, open-ended fume extraction systems, refractory services. This very tough and flexible material can be cut with hand tools. 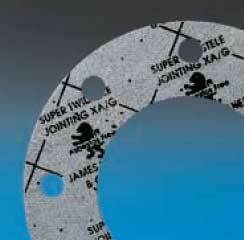 Cut gaskets to any shape, size or quantity. In sheets: 1.2m x 1.2m. Thicknesses in multiples of 1.3mm.